Dafna Meir was stabbed to death Sunday at the door of the Otniel home she and her husband Natan made for their family of four biological children and two additional children they fostered. The killer is still on the run. Mrs Meir was a nurse - which in Israeli hospitals always means nursing patients who are Jewish, Moslem, Christian and whoever else needs nursing - and a guide to many. 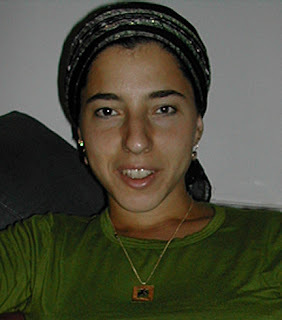 She also managed to write a blog (in Hebrew, naturally enough), Women's Ways. and was originally published earlier today on the Israel National News site. We hope it is copied and conveyed widely. May it be Your Will, Creator of the world, He Who manages it with mercy and loving kindness, to grant me the ability to give medications to Your people in need of salvation, and also to the members of other nations who are in the devoted care of your faithful messengers, who continue their holy work day and night, on the Sabbath and holidays, without letup. Grant that I understand, remember and realize, that the medications are a gift from You, and their efficacy is Your message to us. Grant that I view and feel joy at their beneficial influence of the medications I, mercifully, can give those who are ill.
Grant me the ability to concentrate when giving out these medicines, to understand the way each acts on disease. Grant that I notice in time any of my errors or those of my colleagues when handing out medications, and that I act quickly to correct the errors before the medication enters the body of the patient. Grant that I act with modesty, learn and teach others about the successes and failures in giving medication. Grant that I give medications to the sick from a position of good health and that I remember to be grateful that I myself do not have to take them. Grant that I learn to have empathy, although in good health, with the patient's suffering and help him with all my ability every day and every hour, using the tools that You have given me. May her memory be as a blessing. And see "Sometimes I feel we are in a game of Russian Roulette" which Dafna Meir Z"L wrote recently about her thoughts on security and danger. That too was translated by Rochel Sylvetsky-Tabak.